Installing a set of heavy duty replacement differential covers is one of the cheapest modifications you can do to your Jeep that’ll help it look cool and give it some extra protection. Over the years, Jeep has come a long way in beefing up the Wrangler and with the new JK model, I was pleasantly surprised to see it come complete with skidplates protecting the automatic transmission, transfer case and gastank. There is so much I absolutely love about the all new 2012 Jeep JK Wrangler – I love the new interior, all the new creature comforts, tailgate that stays open on it’s own and who could forget the awesome 3.6L vvt Pentastar Engine with 5 speed automatic transmission. But, I do have to say I was a bit surprised to see all the new changes under the belly including a crazy exhaust loop, dangerously exposed transmission cooler line and no skid plates presnt to protect any of it. While the Jeep JK Wrangler comes with great skid plate right from the factory that actually does a job of protecting your 42RLE Automatic Transmission, it does have a way of getting in the way of your drive shaft if you have a 3″ or taller lift installed. Because of this problem, there are a lot of people choose to remove this skid plate but, by doing this, you leave the thin transmission sump pan dangerously exposed to rocks. For those of you who have a long arm kit installed on your JK, removing your transmission skid plate is a requirement. So, what is one to do? Well for me, I decided to get a Rock Krawler heavy duty replacement deep sump transmission pan. When it came to designing the all new Jeep JK Wrangler, Chrysler did an outstanding job of including a tough set of skid plates to protect just about everything sensitive underneath except for the oil pan. The question of why is beyond me but one of the best answers to addressing this deficiency is to replace the factory pan with an all new Benchmark Designs Rockcrawler Oil Pan. While the all new Jeep JK Wrangler does come complete with skid plates for the transmission, transfer case and gas tank and all of which are more than adequate for hard trail use, for some reason, Chrysler decided to leave the oil pan completely exposed. Of course, left unprotected, a significant hit to your oil pan can immobilize your Jeep and leave you walking. When it comes to protecting the sides of your Jeep JK Wrangler Unlimited, few rocker guards offer the heavy duty strength and style the way FabFours rock sliders do. These form fitted rock sliders mount directly to the body and offer more than just serious protection from the rocks but also a unique and stylish look. Structurally reinforced and designed to be tied into the body mounts of your Jeep JK Wrangler, the Fab Fours rock sliders extend out to the edge of your fender flares and wrap all the way underneath the body in a smooth flat plane. This design effectively helps to keep rocks and trees away from the side of your Jeep’s body, allow you to slide cleanly over obstacles and it even does a great job of acting as a convenient step. One of the most common things most people hit on their Jeep JK Wrangler’s when playing on the rocks is the lower control arm mounts at the axle. They are after all located next to your tires and positioned low to the ground and a simple slip off of a rock can have you coming down on them and hard. For the most part, this really is not that big of a deal as the factory control arms can take quite a bit of abuse especially at the joint but like many other JK owners I know, I have found that the axle mount flanges have a tenancy to bend and significantly even from mild impacts. And, over time and repeated abuse, these flanges can and will break. By the time I got my Jeep JK Wrangler into Off Road Evolution, the inner flange of my control arm axle mount was already showing signs of cracking. Needless to say, I decided to have these flanges reinforced with a weld but also decided to beef them up with a set of Off Road Evolution EVO Front Lower Control Arm Skids. When it comes to frame mounted rocker guard protection for your Jeep JK Wrangler Unlimited, few can compare to the high quality construction, strength, function and clean design of the Shrockworks Rock Sliders. Built with severe punishment in mind, the Shrockworks Rock Sliders are designed with beefy squared tubes that sit just below the body pinch seam of your Jeep JK Wrangler Unlimited and features a round tube side bar that extends out and angles up to provide maximum ground clearance and protection for your Jeep. Additional benefits of the tube side bars is its ability to be used as a Hi-Lift Jack point and of course, serve as a viable side step. What I like most about the PUREJEEP Jeep JK Wrangler 2-Door Rocker Guards is how clean and deliberate they look once they are installed. 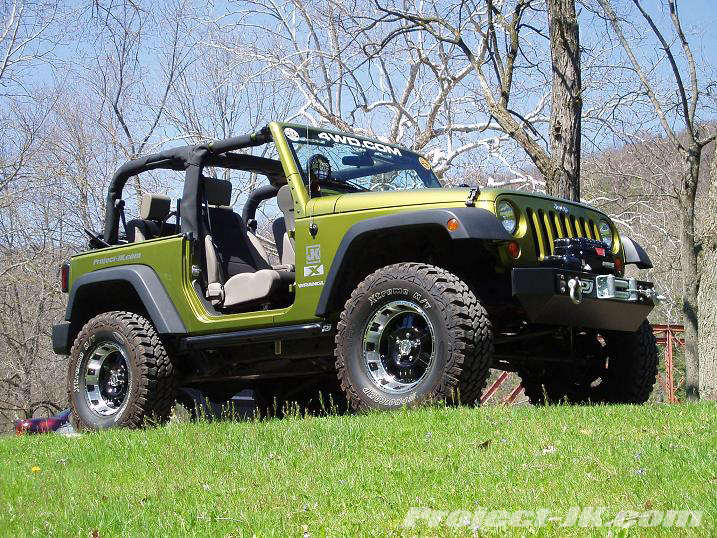 In fact, because of the way they have been designed to mount directly to the factory pinch seam (much like the factory Rubicon Rocker Guards) and have been shaped to follow the contours of the new JK body lines, the PUREJEEP Rocker Guards provide a look as if they were designed by Jeep itself and offered on the JK right from the factory.